Motorola Xoom, the first real Android tablet, sold 250,000 in the first quarter of its release in 2011. No updated numbers are readily available since then, but given the lack anything resembling marketing coming from Motorola around the Xoom since then, along with increased competition from other manufacturers, I would guess that last quarter saw no more than 250,000 units sold in the past quarter as well. Samsung Galaxy Tab 10.1 sales numbers are not broken out. However, a Lenovo executive claimed that the device’s smaller cousin, the 7″ model, has sold no more than 20,000 units at retail. ASUS Transformer Prime, the best Android tablet that I have used, revealed in a court case that they had sold 80,000 units in the first few months (~2,000/month). In short, sales of Android tablets are measured in tens to hundreds of thousands, where sales of iPads are measured in tens of millions. We experience the enterprise divide every day at Mediafly. Many of our enterprise customers want to support Android tablets, but when pen comes to paper, the iPad is all that managers care about. This divide is further driven home by recent research from Good Technology, makers of enterprise email solutions. They find that 97.3% of enterprise activations for tablets in first quarter 2012 are iPad versions. The remaining 2.7% are for Android tablets. The way this market is shaping out is quite depressing for an Android supporter like me. (As you may know, I’ve been recognized for my work building Android apps, and have built the popular Chicago Transit Tracker in the Android Market.). And there seems little that will change this in the near future. Below are my reasons for why Android tablets won’t come to dominate enterprise tablet usage over the next few years. No price advantage. While Android smartphones have a major price advantage to the iPhone ($99 for an unlocked entry-level Android smartphone, vs. $549 for the iPhone), the same price disparity can’t be found with tablets. The Galaxy Tab 2 10.1, Xoom, and iPad 2 all hover around $399, while the Transformer Prime prices at around $499. Phones are a necessity, tablets are not. If you are going to spring for a tablet, or if your company will buy a set of tablets for you and your coworkers, you/they will usually buy the market leaders, the safe option. This means the iPad. The iPad (3) is, frankly, better. I’ve used the Kindle Fire, NOOK Color, Samsung Galaxy Tab 7″, Motorola Xoom, Sony Tablet S, and ASUS Transformer Prime. Of all of these, the only tablet that comes close to the usability and smoothness of the iPad is the ASUS Transformer Prime. And that device falls short as well: the keyboard is awful, the display is not a retina display, and there is no cellular capability. And let’s not forget that ASUS’s marketing is hopelessly outmatched by Apple’s marketing. You will notice that I don’t mention apps. Are apps important? For the consumer, absolutely. For the enterprise, less so. That will be a topic of another blog post. I was very skeptical when I first learned about Evernote, a service whose mission is to help you “remember everything”. This seemed like another Web 2.0 company so focused on Free that they wouldn’t last. Their product sounded hoaky – a glorified notepad for (initially) iPhone. I already had alternatives to that: emails that I send to myself or leave in draft form, Google Docs, and Word + Dropbox. I like taking notes in a notebook – when you need to scribble something down or draw something, nothing is faster. Granted, the ability to search your notes is nonexistent, but I have my own rudimentary method of organization honed during my time as a consultant at Bain. After a coworker showed me how he uses Evernote to take notes during meetings, and all the interesting features that go with it, I thought I would dip my toe in (while keeping my paper notebook close at hand for safety). Now, 45 days and 74 notes later, I can safely say that this service is fantastic. I use Evernote on whatever device I’m closest to. This is the Number One selling point to me: whether I have my phone, laptop or tablet(s) with me, I have all of my notes in one location. I organize notes into (currently) 11 different Notebooks, which are similar to GMail’s labels, loose associations of individual notes. I have differente Notebooks for each of our customers at Mediafly, another for Prospect meetings, and a couple for other functional areas (Product, Marketing, Engineering, etc.). I also have a few Notebooks for personal areas. Oftentimes, as a part of product management, engineering, or marketing, we will have long whiteboard sessions. These will often result in a series of block diagrams, sketches, and notes on the whiteboard. In the past, I would have to manually transcribe these into the notebook. Now, I simply take a photo with my phone or tablet and drop it into a Note in the correct Notebook, and I’m set. Biking to work today, I pull up to Milwaukee and Grand. While stopped, another biker pulls up next to me. If you are on the fence, give it a try. It’s free to start and easy to shut down if you decide that it isn’t right for you. Ah, the fun never stops with Dentrix. As a part of the massive buildout of Forever Dental, we decided to upgrade from our aging Dentrix 11 to Dentrix G4 in order to better facilitate more than doubling the number of workstations that access the server. A beautiful Saturday afternoon rolls around (one we’ve committed indoors to this upgrade). We met the system requirements, walked through the Ten Installation Tips, and are ready to go. We put the DVD in, cross our fingers, and press “Install Now”. After clicking ‘Next’ a few times, we are greeted with this. It reads “Database Conflict. 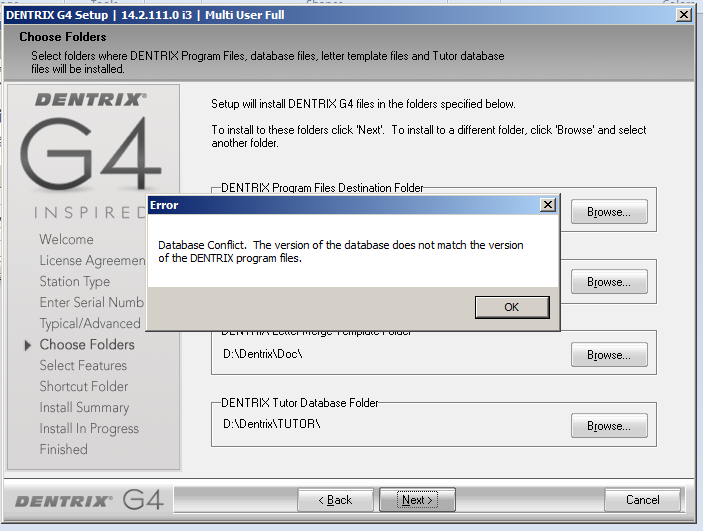 The version of the database does not match the version of the DENTRIX program files”. 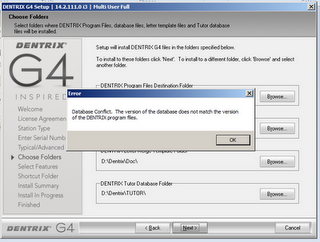 Since we had scheduled this upgrade on a Saturday afternoon, Dentrix Support was closed. 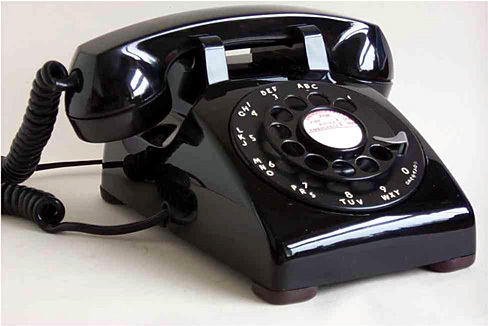 We were likely the first callers when Dentrix Support opened Monday morning. After walking through the situation, our tech support rep told us that the issue is due to a couple of missing *.idx or *.dat files in the Dentrix/data directory. We walked through every file that was supposed to be there (approximately 30), and, behold, it turns out that 3 were missing (LCM_Log.dat, LCM_Case.dat, LCM_Def.dat). We would have to use Dentrix 11’s Selective Setup to install _only_ those three files. The good news was that these files related to Lab Case Manager, which was never used in the practice. The bad news was that this might destroy the entire database. After completing the Selective Setup, we were to run Rebuild to rebuild the entire database, the continue with the upgrade. We started the entire process again at 6PM, after the last patients left and after we backed up the system. Selective Setup completed, Rebuild completed, and the data appeared sound. We then ran G4 installation, and after a tense 20 minutes, it completed successfully. Or so we thought. Immediately after completion, I launched Appointment Book on the server. Crash. I launched Office Manager. Success. I clicked on Appointment Book from Office Manager. Crash. I wish I took a screenshot of that error that we got, because it was a scary looking one. At this point the time read 6:58PM (Central time). Dentrix Support closes at 7PM. We called them immediately and thankfully they were open. We spoke to another tech, and learned that Windows Server 2008 R2 does not by default install .NET Framework 3.5.1, and we had to do this manually. I ran Server Manager and clicked on Features, then Add Feature. I clicked on the + next to .NET Framework 3.5.1 and clicked the checkbox next to .NET Framework 3.5.1. I specifically did NOT check WCF Activation (as indicated by the Dentrix Support tech). I clicked Next and finished up the installation. After completing this, Appointment Book opened successfully. 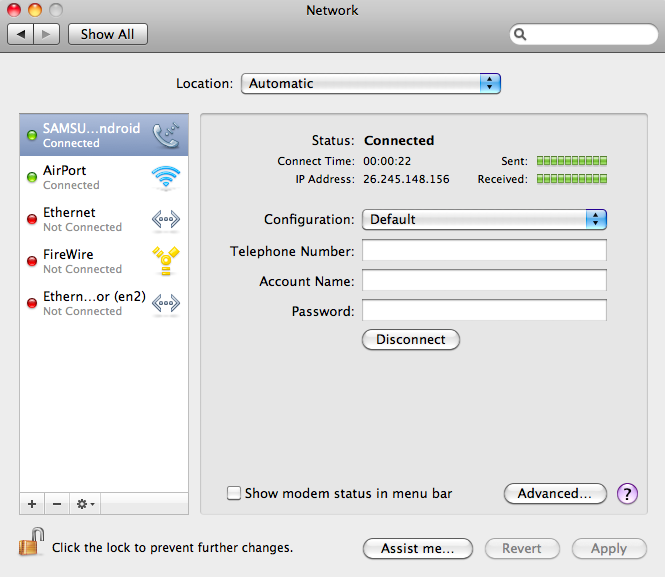 Several days after the upgrade, everything seems to be running smoothly. Oh, how resourceful we can become! 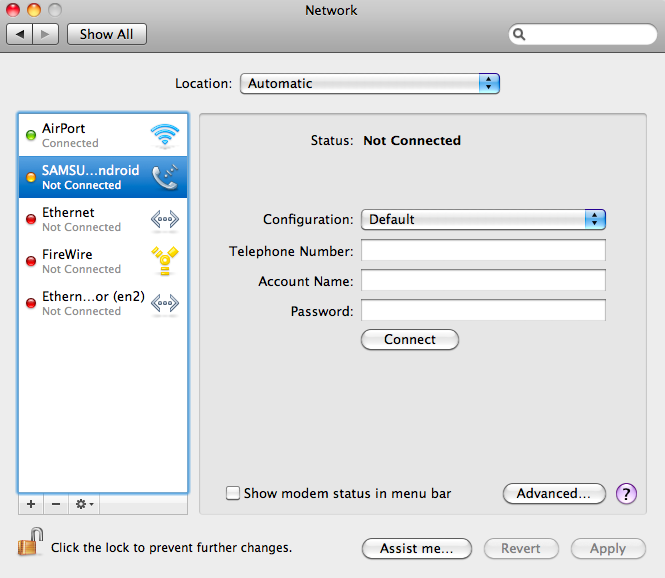 Faced with an Internet connection reminiscent of the 56kbps dial-up days while at work, I dove into finding a way to tether the Galaxy Tab 7″ with its unlimited data plan to my Mac OS X (Snow Leopard). It turned out to be easier than I expected. Plug your Tab into your Mac. 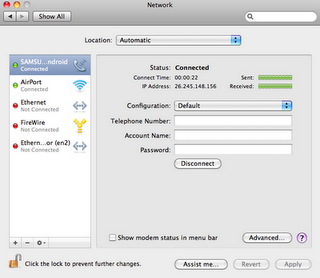 On your Mac, open System Preferences > Network. You should see SAMSUNG Android in the left. Select it and choose “Advanced…”. In Vendor, select Samsung. 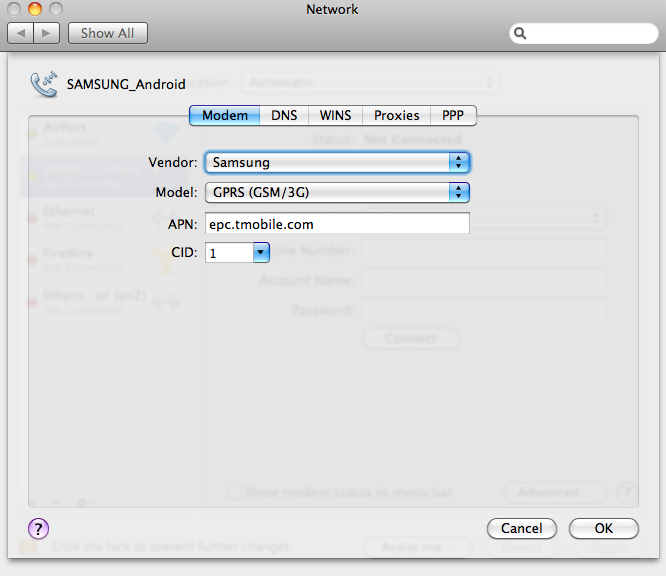 In Model, select GPRS (GSM/3G). 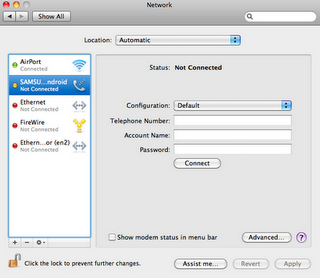 In APN, enter the APN for your Tab. 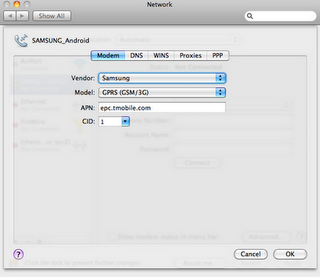 You can find the APN on the tab in Settings > Wireless and network > Mobile networks > Access Point Names. Click OK.
Back at the main screen, tap Connect. After a few seconds, the status next to SAMSUNG Android should turn green, and the Sent and Received bars should flicker green. That’s it! Now wasn’t that easy? Dropbox is a phenomenal service. Over 25 million users agree. We use the service extensively within Mediafly for file transfer and syncing of non-sensitive files, and it has become a part of our daily production workflow. Most of our partners and customers use Dropbox as well, to shuttle files back and forth with us. In fact, several team members have reached the referral limit because of the number of other users they have brought onto the service. We have received a question from a few companies that produce a lot of video: “how is Mediafly different than Dropbox?” Specifically, these companies want to distribute pre-production dailies, rough cuts, studio cuts, and more, to their executives, producers and directors. Installation is easy – users simply need to download the app, sign up with a credit card, and start using. Security: Dropbox has had a fair number of security holes discovered. While most services will have issues that need to be found, addressed, and appropriately apologized for, the approach Dropbox seems to take is “simplicity over security”. They prefer the service to be simple and easy to use, and if necessary security takes a back seat. Content security: Dropbox is not built to keep your content secure. Video and documents are stored in exactly the same format that you place them into a Dropbox folder. The only form of device-level security is a four-digit PIN; beyond that, content can be easily retrieved from any rooted or hacked device. Speed: Uploading a video to Dropbox’s service is slooooow. Even over fast Wifi connections. Even on paid accounts. The company is clearly limiting bandwidth, in the interest of constraining costs. We have seen speeds as slow as 30kbps. This translates into ~10 hours to upload a 1GB file. The system was not created for speed, and as a result transferring large videos will take a long time. Playback: Playing video via Dropbox uses the simplistic progressive download method. High-quality videos buffer constantly, or require a large amount of time to fully download prior to playback. Meanwhile, modern adaptive bitrate technology like HTTP Live Streaming or RTMP is nowhere to be found. Control: Dropbox offers rudimentary support for permissions. A folder in a user’s account is fully locked down. That user can share that folder to another Dropbox user. However, say you want to give 3 users read-only permissions to a folder? Or, worse yet, say you have two subfolders that should only be visible for one of your users? None of this is possible with Dropbox, and you are forced to constrain your choices to match the simplicity of the service. Worse yet, since there is no ability to give users “read-only” access, any user with whom you share files can then delete those files! Branding: Dropbox’s website and apps are always under Dropbox’s name. There is no opportunity to use your own brand. Android is native operating system for phones (and now Tablets), Chrome (or Chrome OS) is a primarily web-based operating system that will be targeted for “devices, tablets and TVs”. Android has the Android Market, on the surface similar to the Apple App Store to distribute/sell apps to devices. 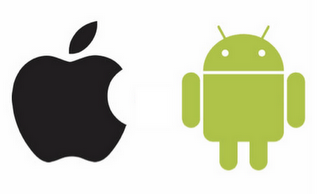 Both Android Market and App Store take a 30% cut of sales. Apple keeps its 30%, while Google distributes its 30% to handset manufacturers and/or telcos. Chrome OS will have the Chrome OS (web app) Store, which, even in closed beta, seems to have solid discoverability and organization built in. Next, my hypothesis: Google wants Chrome OS to beat Android. There are lots of reasons for this. History: Google’s history is web software, and they excel at quickly creating simple, scalable web applications. Android is native software (i.e. software that is stored and executed on your device), which they historically have eschewed. Consider the Google Voice Desktop App saga. If true, Google pulled a potentially killer desktop product because it was not ‘web’ enough. Control: Android is almost fully open source, while Chrome OS’s web underpinnings inherently make it closed source* Chrome OS’s user experience is loaded over the wire after Chrome OS gets onto the Internet, ensuring that closed web apps take top billing on the OS. Because Android’s source code is readily available, other developers and device makers can fork it, customize it, even go so far as to rip out Google as the default search engine and drop Yahoo or Microsoft in its place. The same (likely) can’t be done to Chrome OS, because the guts of the operating system are loaded from Google’s servers when you turn the machine on. UPDATE: struck out the incorrect bits. Thanks, Mark. Android Market pales in comparison to iTunes and (at least by the screenshot) Chrome’s upcoming Web Store. 2+ years and 100K apps after the first Android phone was released, there is still no web presence (outside of a couple hundred apps) for the Android Market, while the other two have (or will have) robust ways to navigate and discover new apps from your PC. The developer console to the Android Market is plagued with repeated, significant problems. Most recent: developers with multiple apps have not been able to see all of their apps for many days now. Google will lengthen Android’s release cycle from every 6 months to every 1 year… oh wait, they have already announced this. Increasing the cycle length reduces the speed at which features and functionality will be built into Android, and allows its competitors to catch up or keep moving past Android’s feature set. Google’s press/blog entries for Chrome OS will increasingly talk about how it will power phones. Google will fast-track Chrome OS to try to beat Android on tablet devices. The Galaxy Tab sold a reported 600K units in its first month. While solid, this number is still low enough to allow Chrome OS to supplant Android as the non-Apple dominant tablet OS. Google has to act quickly for this, however, as the momentum behind Android by device makers is very significant. Having considered Android, and the smartphone space as a whole, ‘conquered’, Google’s senior Android engineers will increasingly be allocated to Chrome OS. Unless Chrome OS dies out of the gate, future Android releases will be underwhelming in both user features and developer tools. * Yes, Google released the source code of Chrome OS. However, much like Android, the key bits are either going to be closed-source (GMail, Calendar, Android Market), or hosted on Google’s servers where they are untouchable to outside developers. Thoughts? Other points? Factual inaccuracies? I’d love to hear from you. How stupid are some people? A new web service is pushing beyond the traditional information-sharing lines found on Twitter, Facebook, and their social brethren (names, hometowns, birthdays, pictures, etc.). Blippy.com intends to show to the world exactly what you purchased through your credit cards. You sign up, enter your credit card details, and choose how much data you want to share to your social network (Facebook, Twitter, etc.). Why would anyone want to do this? What benefit is there from my friends seeing how much I purchase at a given retailer? How is the world better now that it knows that I spent $27.53 at Amazon.com to buy a pack of AAA batteries and the latest Dan Brown novel? If you think this idea is as ridiculous as I do, and agree that all those people who put their private financial information at risk for absolutely no benefit are incredibly stupid, you’ll be thrilled to know that only one day after “going beta” and being introduced on TechCrunch, the site is now tracking over $1M of sales. Of course, this information is invaluable for Blippy. Private purchase data, ripe for analysis and resale, all at their disposal. By the way, this company was founded by the creator of F*ckedCompany, the once-popular 2000-ish website that tracked layoffs across large and small companies alike. At least now you can understand what kind of minds dream up this stuff. There has been a lot of discussion recently (at least among those who follow this stuff) about Android 2.0, Google Maps adding turn-by-turn navigation, and Google introducing the Chrome OS, it’s new operating system. For those who know me, I have been following Android-vs.-iPhone very closely for over a year now, and have believed from the very start that Android will win. There are a lot of similarities between Android-vs.-iPhone to the Windows/PC-vs.-Mac battles in the 1990’s, from a high level. Android is open, like Microsoft was open: Any manufacturer or carrier could use the free Android operating system on any of their platforms. Conversely, Apple is closed. No other manufacturer is allowed to use the iPhone OS, and (at least for now) iPhone is contractually limited to AT&T. However, this article by VC Bill Gurley lays out very clearly why the pace towards adoption of Android will accelerate: Google is sharing search revenue with its partners. So, not only is a manufacturer like Motorola able to load the Android operating system without paying a licensing fee to anyone, if they load the Google-versioned Android operating system, they can receive a chunk of revenue from Google search that flows through their handsets. Bill Gurley dubs this “less than free“, and while I don’t agree with that name, the generally brilliant concept is that Google is buying market share for Android. Now, step forward to Google Chrome. Google representatives have announced repeatedly that they are building an operating system called Chrome, ostensibly to take on Microsoft Windows. For a long time I questioned why, but this article makes it clear: with an operating system that HP or Dell or Acer loads (for free, of course, relative to Microsoft Windows), and with partner search revenue that flows from Google to the PC manufacturers, the adoption of Chrome will be lightning fast. A lot of press coverage hit my sources about PhotoSketch, an “Internet Image Montage” research project from five students at Tsinghua University and the National University of Singapore. It looks like an astounding piece of technology, and a lot of fun to play with. Unfortunately, the site was taken down due to an unbelievable amount of traffic (what’s called being “slashdotted”, named after a site is brought to the attention of the popular technology news site slashdot.com). Run the image through and get back a photo montage compiled from available online images. Just let the pictures and video speak for themselves. I wonder what the image in my previous post would translate to? Much like AT&T did 20 years ago to maintain its growth, Google is trying to do the same — control the data distribution channels. In the case of AT&T, it was all about information delivery to business and residential users. In the case of Google, it’s all about advertising delivery to its “product” — the users of its services. The trouble with wanting to dominate all delivery channels (whether it be information or advertising) is that you are forced to go further and further afield from your core competency. And while playing in disparate businesses is something a leader brand can afford to do, over time the core business tends to suffer — slowly but inextricably. Then at some point, you are willing to throw out the knitting needles. AT&T did, and it did not end well. Google looks like to be headed in the same direction. I am the Chief Technology Officer at Mediafly, Inc. I am a technology entrepreneur and manager, former management consultant, Chicago Booth MBA and UIUC Computer Scientist. My musings on the economy, politics, technology, mobile, photography, biking, and dental.